This PowerPoint goes along with the vocabulary for Unidad 3, Leccion 2 in the textbook Avancemos 3. 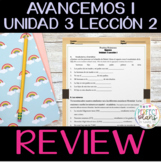 Avancemos 1: Unidad 3, Lección 2 vocabulary, grammar guide and grammar practice activities. This is a comprehensive study guide for the entire chapter. This PowerPoint goes along with the vocabulary for Unidad 2, Leccion 2 in the textbook Avancemos 3. This activity contains a matching vocabulary section and preterit and imperfect verb conjugation practice. Looking for a quick review before the big assessment? Here you will find a variety of activities and tasks that can be used as pre-assessment, review, homework, classwork or quiz. Includes an answer key. Word Search Puzzle with Avancemos 3, 1.2 Vocab. These are images for the Avancemos 3 Unit 4 Lesson 2 vocabulary which we use for a "Go fish" game, for matching, for making sentences for anything where images will spark communication. Here is a document, easy to share with your students digitally, for them to access the key terms for Unit 3 Lesson 2 in Avancemos 1.